Win A FREE Membership when you Like us on Facebook! Click to Like the Hazel Atlas Glass Collectors fan page on Facebook! The next time you go to an antique shop, auction, swap meet or flea market, know what you are buying! Our site is accessible through mobile devices while you are picking and antique hunting! 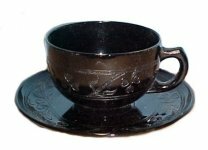 Hazelatlasglass.com is the #1 resource online for collectors, pickers, buyer and sellers of Hazel Atlas Glass. 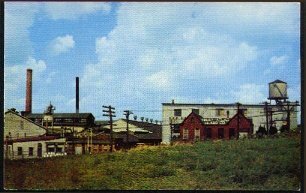 Above is a postcard picture of the Hazel Atlas Factory (#2) as it stood in 1950. (Visible from I-70 West) Do You know how a lot of early Glasswares originated? 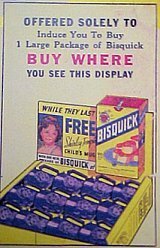 Shirley Temple Mugs were given away when you bought a featured product at the local grocer. 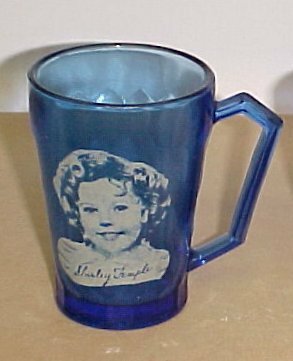 Is this Shirley Temple Children's mug Original or is it a reproduction? 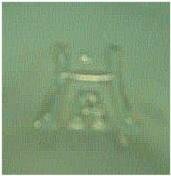 Do You know how to tell Reproduction Glass from the original? Join our site and learn. Don' make A $60 MISTAKE! Answer this month's trivia question correctly and you could win an Annual Membership to hazelatlasglass.com! 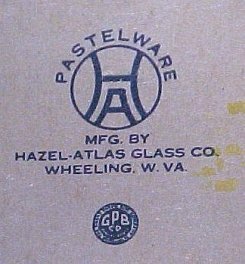 Hazel Atlas Glass began production of dinnerware in 1923, what was their trade name for this first pattern? Last Month's trivia question was answered correctly by Tanya R. of San Diego, CA, Congratulations Tanya! What is the Most Popular Pattern produced by Hazel Atlas Glass? 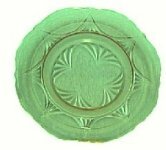 This pattern is collected by more people than any other pattern of depression glass. What is this depression glass pattern? Fill in the form to your right with your answer and you could be our next WINNER! Last Month's Answer: According to a survey conducted in 2011, the most popular pattern was Florentine. Primarily because of the variety of different pieces. Winner is selected from a random drawing of all correct answers. Winner grants hazelatlasglass.com permission to use their name in any promotional material. Decision of judges is final. only email entries are valid, and only one entry per person. Find all your Hazel Atlas Glass patterns here! We have two ways to join, you can be an Annual Member or a Lifetime Member. The Annual membership lasts for 365 days from the date of payment and is renewable at any time. The Lifetime membership begins when you pay and will never expire. Our regular subscription prices are $19.95 Annual or $29.95 Lifetime. SPECIAL - This Month Only! special prices are $14.95 Annual and $19.95 Lifetime. Click here to Join today! We gladly accept your Check or Money Order. and on the left, a piece of depression glass. look like, as many people confuse it with Anchor Hocking. Hazel Atlas Little Hostess Moderntone Tea Party Set in rare Black and Pink with teapot. Monthly Hazel Atlas Newsletter Join Today! 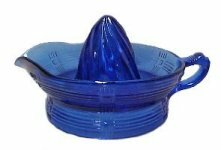 Get a list of what you have and make sure you know the value of the depression glass and Hazel Atlas pieces you are selling or buying. Join the Hazel Atlas Glass collectors website today! Tell us all about your finds or upcoming shows on the FREE Hazel Atlas Glass forum! Look for the Next Issue of Hazel Atlas News in your mailbox! If you enjoy depression glass, EAPG, Hazel Atlas Glass or elegant glassware and have not yet subscribed, please do so now by clicking the link below. You do not want to miss a single issue of the FREE Hazel Atlas News. You can Read more about the 'Hazel Atlas Glass Company' by joining our site. Members get full access to all our pages, resources and information PLUS... free membership on our private forums! We have two ways to join the Official Hazel Atlas Glass website, you can be an Annual Member or a Lifetime Member. The Annual membership lasts for 365 days from the date of payment and is renewable at any time. The Lifetime membership begins when you pay and will never expire. Our regular subscription prices are $19.95 Annual or $29.95 Lifetime. SPECIAL Discount membership - $19.95 Lifetime. Click here to get the discount membership today! We accept all major credit cards or Paypal. If you sell Hazel Atlas Glass on your website, we have a special offer for you! Place our link (http://www.hazelatlasglass.com) in the area where you sell Hazel Atlas Glass on your website, then drop us an email with the page and we will list you in our Member Directory of Hazel Atlas Glass sellers. Once you place the link, email us and let us know so we can post your link in our member directory. ©2000-2015 hazelatlasglass.com, Publisher All Rights Reserved Reproduction of this page, style, images or text in any media (electronic, printed or other means known or unknown) without the written permission and authorization of the Publisher is strictly prohibited.